Wisdom Of The Crowd Review - Rich Tech Cop Gets Another Shot - Are You Screening? With the demise of APB, you might think that we’d wait a while before we had to endure another series about a tech billionaire who is tragedied into taking on law enforcement, but Wisdom of the Crowd gives the same outline another go. 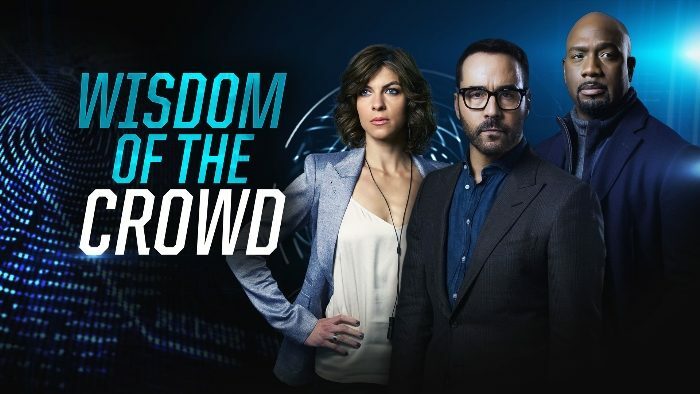 The main differences are that Jeffrey Tanner (Jeremy Piven) isn’t a wisecracking man-child, and instead of outfitting a police force with gadgets, we’re just running a crowdsourcing crime App. The show may spin the premise, but it has the same potential and is likely to fall victim to the same problems. Tanner is the creator of a mythical social media site that he suddenly sells off so that he can focus his time on an App that he imagines will be used by everyone to help fight crime. His daughter was tragically killed, and though the police charged someone who was subsequently convicted of the crime, Tanner is convinced that they don’t have the right man, and his daughter’s killer is still out there. He has a team working to drive the App’s progress, and he recruits Detective Tommy Cavanaugh (Richard T. Jones) to coordinate things with the police. The team is the typical, quirky bag and includes – Sara Morton (Natalia Tena), an engineer who is closer to Tanner than makes for the best working relationship, Josh Novak (Blake Lee), a programmer who is overly used simply to have a “nerd” factor on deck, and, eventually, Tariq Bakari (Jake Matthews), a hacker fan of Tanner’s who exposes problems in the system shortly after it goes online. The show’s main sell is Jeremy Piven, hot off the brilliant Mr. Selfridge, and if there were no other factors to take into account the show would be a definite win. Some of his opening moves are a bit stagy, but this isn’t the easiest sort of establishment to pull off. Beyond that, especially considering Tanner is a more relatable billionaire than we’re used to, Piven works his charismatic magic as solidly as anyone could hope. Still, the show has to pull you in with its gimmick, and this one approaches things in a way that not only draw viewers into this world, it makes you wonder why this isn’t already a thing. Lawsuits and liability aside, you’d think someone might have taken a chance on this idea by now. The show needs to lay out how investigations are going to happen in concert with the App, and though the pilot might not choose the best account, it sets the stage for something audiences can get behind. The problem with the show, much like APB, is that this is apparently an age of network television that demands that everything aim at the lowest common denominator, even when the premise itself seems to be at odds with that idea. Characters are drawn with mile-wide brushes, and many of the actors overplay their roles like first-time stage actors trying to fill a room. Cops are closed-minded and roll their eyes at alternative theories to cases built on flimsy, circumstantial evidence as if they had video of the crime. Programmers are caricatures of “awkward,” and that’s when they’re something more than a live-action teleprompter delivering lines we need the audience to hear. The pilot does run us through an interesting premise, and maneuvers well through the progression of the investigation. It feels more like “above ground” Person of Interest (when it was good) than anything, and it delivers a solid mix of intrigue, investigation, and exposure to the “crowd crime-solving” effort. The blend of action and drama, especially when we’re getting into personal lives, might not be perfect, but this is a show that makes you want more. Where the show plagues itself with uncertainty is in offering up characters that are at such odds with Piven’s effort at complexity. That can easily become an insurmountable problem for any show, and if things don’t turn around in a hurry, people aren’t going to come back. Piven’s working a great character here, and it’s one that could easily carry the vast majority of this show’s needs, but we can’t move from that character to a police department that is bordering on silly. Much like this season’s The Good Doctor, things are needlessly overplayed. In that show, perfectly reasonable people will have trouble accepting an autistic surgeon, so we don’t need a hospital of assholes. Here, figuring out how to work with this system is going to cause a lot of problems on its own, we don’t also need mindless cops who can’t imagine that innocent people could be convicted of crimes. The pieces are all here for this one, and if the writers let this settle into something that doesn’t work so hard to signpost everything, it will likely become a favorite for a very wide audience.